Update July 6, 2011: The Metro Council has approved Escobar's nomination. She will take the job of Metropolitan Clerk effective August 1. 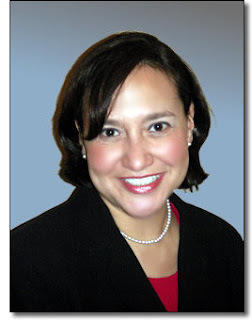 Mayor Karl Dean has nominated Nashville attorney Ana Escobar to succeed Marilyn Swing as Metropolitan Clerk. If confirmed by the Metro Council, Escobar would become "the first Hispanic woman to head a department of the Metropolitan government," according to the press release. Escobar, raised in Nashville, was born in Colombia, South America. Ana has appeared in my court as both a prosecutor and a public defender, and she has always impressed me with her professionalism and her courtesy. She is a great attorney and a wonderful person. Ana really impressed me during her interview. Her desire to serve our city was evident, and I look forward to working with her in the future. Today is a significant milestone for diversity in Nashville. Census numbers show that 10% of Nashville’s population is Hispanic, and Ana’s appointment to this important role speaks to the Hispanic community’s many contributions to our city. It is also a testament to Ana’s professionalism and to her outstanding reputation as a lawyer. Escobar started her career defending indigent citizens in the Office of the Public Defender and later became a prosecutor in the Office of the District Attorney, where she prosecuted mid-level drug organizations. Escobar has been running her own law firm - the Escobar Law Group - and is held in high regard by the local bar. In 2003, Escobar ranked second in a Nashville Bar Association rating of candidates for Davidson County General Sessions Judge. The Metropolitan Clerk’s Office is the official recordkeeping agency of The Metropolitan Government of Nashville and Davidson County. The Tennessean's Michael Cass, in announcing the retirement of the current Clerk Marilyn Swing, described certain other specific Clerk duties - related to council meetings, referendum and recall petitions, and the revenue-generating business of alarm permit registrations.